Hunting deer and elk with a bow is a hard won skill. Learning what you can get away with up close and what you can’t is a process of years of failures and hopefully growing successes. Nothing is more important to closing the deal than scent. The whole hunt is hanging on the breeze. Deer and Elk detect smells in minute amounts. Lessening your scent and learning when to call off a hunt or an approach often makes the difference. Scent control needs to be well thought out. If you wash your clothes carefully and then use your workday deodorant or don’t shampoo your hair, it’s all for naught. All clothing, boots, socks, towels, soap and deodorants should be treated scent reducing products. Hunters specialties and Moccasin Joe products work well. These products help to even the playing field, but they don’t make you smell “invisible.” Using scent reducers will reasonably give you an edge and possibly the few seconds you need to finish the job. A steady wind is the best situation for success. Sometimes finding a steady wind is as hard as finding game, as swirling wind conditions are very common. Wind direction usually changes predictably throughout the day as the sun warms the air, although storm fronts play havoc with predictable air currents. With all this change how does a hunter manage to find the right setup? Persistence and opportunism! Sometimes the right situation unfolds the first time: you are hunting into the wind and encounter game. We usually plan uphill hunts in the early morning when air currents are still moving down the hill and modify the hunt as the winds shift. 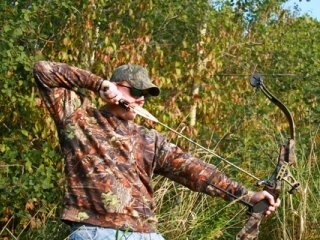 Calling it off can be as important as shooting your bow regularly. Once game is located every situation changes. Is the game where you hoped? Are the winds shifting or unpredictable? Can you call or stalk from a different angle. Locating game is important and not spooking the game in unpredictable winds allows for planning. I’ve had to call off elk two hunts in a row in order to avoid spooking the herd in shifting winds. It’s much better to back off or take a different approach than to blow the herd into the next county. Sometimes it seems that every hunt is hanging on the breeze, and quite often it literally is. Try to reduce your scent and then be flexible. The results of being wind wise are less blown hunts and more chances to eat venison instead of your tag.